Movado, meaning always in motion, has continued to produce some of the most exquisite and famous timepieces since its founding in 1881. A Movado watch is a symbol of elegance and distinction and this new collection represents just that. The Sapphire Synergy collection will do everything but disappoint you. Another sleek design by Movado, this particular watch is a stylish addition to your casual business and weekend attire. 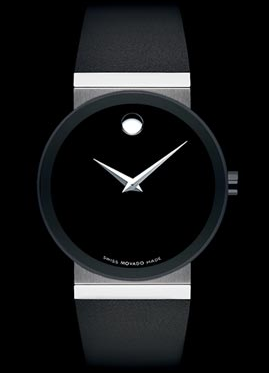 This Movado 606269 Black Sapphire Synergy Women’s Watch is constructed with a black pvd-finished stainless steel case. The bezel is also made of pvd-finished stainless steel and is a stationary function. The first thing you notice on this woman’s watch is the black museum dial, which features silver-tone watch hands and the signature Movado concave dot at the 12 o’clock position. It may not seem like there is a lot of description given to this Synergy timepiece, but that is why the watch is perfect for any wrist; because of the simple and basic design. The dial window is a scratch-resistant sapphire crystal. The black pvd-finished stainless steel case is 34mm in diameter and 7mm thick. The band is black rubber with a deployment buckle clasp and a width of 21mm. This Movado Swiss quartz movement is also water resistant in up to 30 meters/99 feet of water. The Movado 606269 Black Sapphire Synergy Women’s Watch is retailed at $1,495.00 and is available on the official Movado website, at various Movado boutiques and throughout many retailers in the US, Canada and internationally.